Through the project the Tuzla CF wanted to improve critical situation of water and sanitation conditions in primary schools, situated in rural areas of Tuzla canton (biggest canton in BiH with 450.000 inhabitants). There are 122 schools that have increased risk of infectious diseases because of the unsafe and unsustainable water services. As stressed in SDG No.6 and SDG No.3 access to clean water and prevention of illness among school children should be priorities of all local communities. Unfortunately, in Tuzla Canton, the system of regular control of drinking water in public objects exists only for those connected to central water pipe systems. Many public objects, especially schools in rural areas, get water from alternative sources (wells and similar) that are not regularly controlling water quality. We made a database of water supply systems for all school buildings and identified the schools that are exposed to the risk because no regular water control is carried out; we addressed the problem and involved public institutions in implementation such as Public Health Institution and Ministry of Education and signed Memorandum of Understanding to work together. As a result of this work, we have succeeded in setting up water purification filters in 18 schools and providing clean water for about 1600 students. 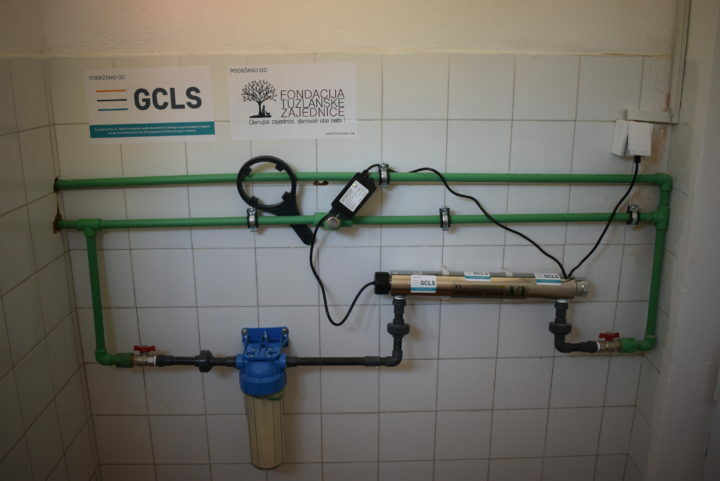 The results of this project are part of a long-term effort to address the problem of clean water in the schools of Tuzla Canton. So far, through the installation of filter systems, we have been able to provide drinking water to 65 of 116 schools under the risk. During the project implementation we carried out water control in 67 schools from the 11 municipalities of TC. The results showed that in 49 schools water is not safe for drinking. In accordance with the financial construction of the project, we planned to incorporate filtering systems into 14-20 schools. Finally, we managed to include 18 schools where we installed filters. These are remote schools that do not have access to the central supply systems and are attended by more than 1,600 students. The choice of priority schools was difficult because a large number of schools were in need. This was of a huge importance to the communities in which we intervened because those are small, often underdeveloped, remote communities where schools are the central objects of all events. The project had a good reaction in public. The project provides systematic approach to the problem and its further solution. Actualized the problem SDG 6 and SDG 3 and promoted the possible solutions to this problem in the education sector, which requires a holistic approach and cooperation between the public and non-governmental sectors. Project activities have initiated related institutions to engage and work on solving this problem. The public health institute will conduct regular water controls. The Ministry of Education and schools will allocate funding for equipment maintenance after the project is completed. And thanks to the project impact, the Tuzla Canton Government will allocate €9200 for the purchase of equipment (UV filters) in other schools at risk.